How often do we get celebrity sightings in Cerritos? Like pretty much never. Well, here’s your chance! On Monday evening, the new Sleep Number store is hosting a health and wellness event with Molly Sims herself from 6-8 pm. She will share her secrets on how to get a good night’s sleep, which is a forgotten luxury since becoming a mother. There will also be refreshments and giveaways. Please see the invitation below for additional details. Hear Ye! Hear Ye! Tomorrow is Jamba Kids Day. What does that mean? It means that along with all the other fun and awesome things kids get to do, they also get to have a free smoothie tomorrow. On Saturday July 27, Jamba Juice will be handing out FREE Jamba Kids smoothies from 11am – 4pm at participating Jamba locations. Kids under 8 will receive a free smoothie. My favorite Sample Sales are here again! Are your kids driving you nuts yet? Who needs some retail therapy? I do! I do! Well, it’s a good weekend to go shopping! The Splendid and Ella Moss warehouse sale is this weekend. For more details, check out my last post on the Splendid sale. Hudson Jeans is also having a warehouse sale this weekend. Check out my last post on their sample sale. This might be your last chance because Joe’s Jeans just acquired Hudson. Several great apps have popped up for free. Get them while they’re FREE! Dr. Panda’s Supermarket: Cute interactive app for preschoolers where they help run the market. Toca Band app is free–normally, it costs $1.99. This is a musical app where your child can play with a variety of sounds to create all sorts of music. You just might want to get a pair of earplugs ready though! This app is compatible with iPhone, iPod touch, and iPad. Requires iOS 5.0 or later. Where’s My Water: If you were too “frugal” to download the full $0.99 version like me, now is your chance. It’s the first time ever this app has gone free so go help Swampy guide the water to his shower. And here’s one for you grown-ups. How to Cook Everything from Mark Bittman is regularly $9.99! The Stella and Sam series is based on a Canadian TV show and the corresponding best selling picture books. My kids love these interactive stories that are a combination storybook and cartoon. This app will appeal to young children ages 1-7. Stella and Sam Story Pack includes all five of the Sam and Stella adventures and usually retails for $5.99. It is compatible with iPhone, iPod touch, and iPad. Requires iOS 5.0 or later. This app is optimized for iPhone 5. Get it while it’s free! In celebration of summer, Mystery Math Town is free for today only! Your kids can add, subtract and even multiply their way to rescue fireflies through town. Normally, it costs $1.99. Compatible with the iPhone only–the iPad app is still $2.99. It’s a Pirate Invasion in Long Beach this weekend! 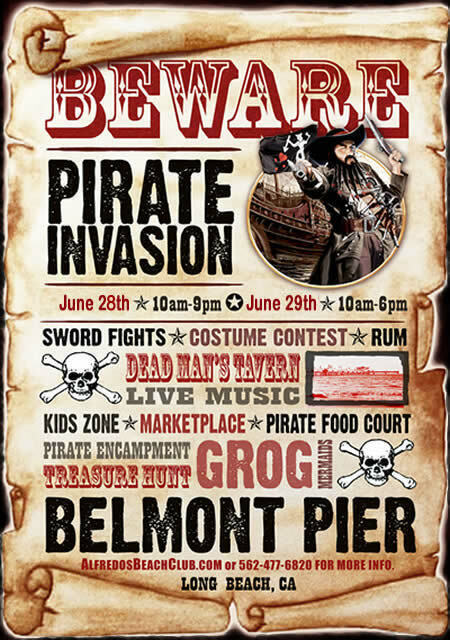 Starting at 10 a.m. the Pirate Invasion will be kicking off at the Belmont Pier. Admission is free! We haven’t had a chance to check out this event but it looks to be a lot of fun. Some of the highlights include a real live pirate battle for treasure with cannons and swords as well as other live entertainment. Go get your pirate on! Maybe they’ll have some Aaartichoke to munch on. Registration for the Cerritos Library’s Summer Reading program will begin on Monday, June 24th in the Art Studio. The program will run through Sunday, July 7. This annual event is themed “Reading is for Champions”. This is a great program that is completely free as long as someone in your family has a library card. Each week children track their reading requirement of 30 minutes a day and at the end of the week, they can redeem it for a prize. At the end of the program, they are awarded a book to take home. You can sign up online prior to going to the library to pick up the materials. Barnes and Noble Summer Reading: Read 8 books and bring completed reading journal to a Barnes and Noble store. Choose a FREE BOOK from the selection on the Reading Journal list at the store. Book Adventure: Free incentive program sponsored by Sylvan learning where your child can earn points to trade in for prizes. Choose from a list of books and take quizzes to determine their comprehension of what they read. Chuck E. Cheese: Earn 10 tokens every time your child reads for 2 weeks in a row. Just fill out the form and bring it in to claim your free token. I’m just not sure it’s worth the headache but if you’re going there anyways, you might as well. Scholastic Summer Challenge: Read * Log In * Win Prizes–that pretty much sums it up. Hi friends! The nice people at Orange Empire Railway Museum offered me 4 tickets for this weekend. We can’t make it out there because it is my daughter’s preschool graduation so leave a comment if you want them. Unplugged and I’m not referring to a cool acoustic concert. It’s AMF’s free summer bowling program where your kids can bowl for free. Just register them here and your kids can bowl two games a day for free. Shoe rentals are not included. Too bad AMF can’t throw in some free acoustic concerts while we’re watching our kids bowl. See you at the bowling alley!